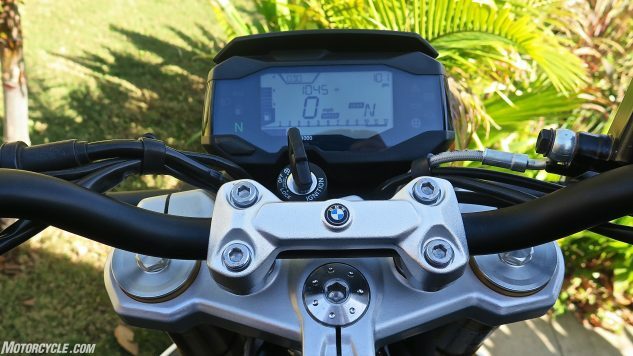 Er, well, BMW’s first made-in-India motorcycle is actually a perfectly nice little piece. Should anybody be surprised? 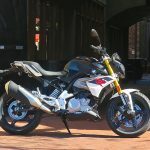 The Bavarians have now beaten the rest of the world (or tied it) in just about every moto category (including bagger with its K1600B); why should inexpensive entry level be any different? You get one 80mm piston, popping up and down 62.1mm per stroke, under a four-valve head and double-overhead cams. 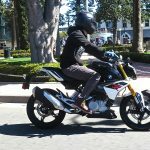 The claim is 34 hp; the fact is 31.45 rear-wheel horses at 9700 rpm on the Dynojet 250 – and 19.32 pound-feet of torque at 7600 rpm. 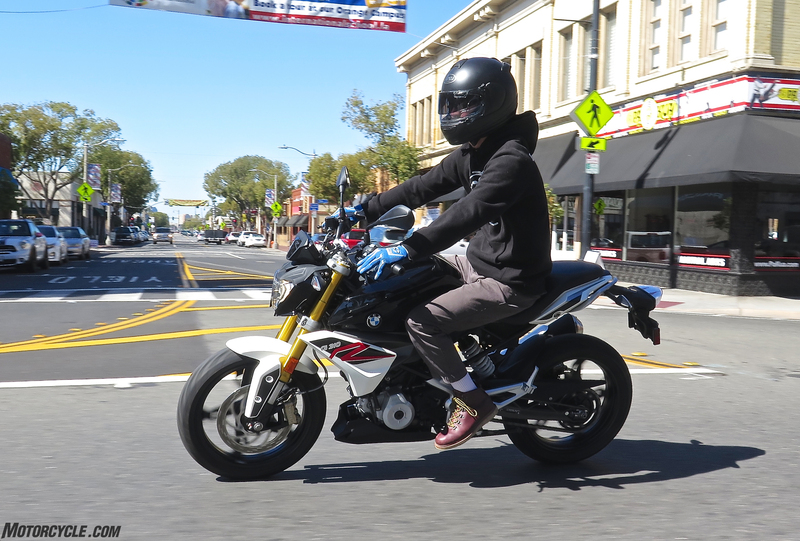 That’s 5 more horses than the Honda CB300F (1000 rpm higher) that won our 2014 Lightweight Nakeds Shootout. 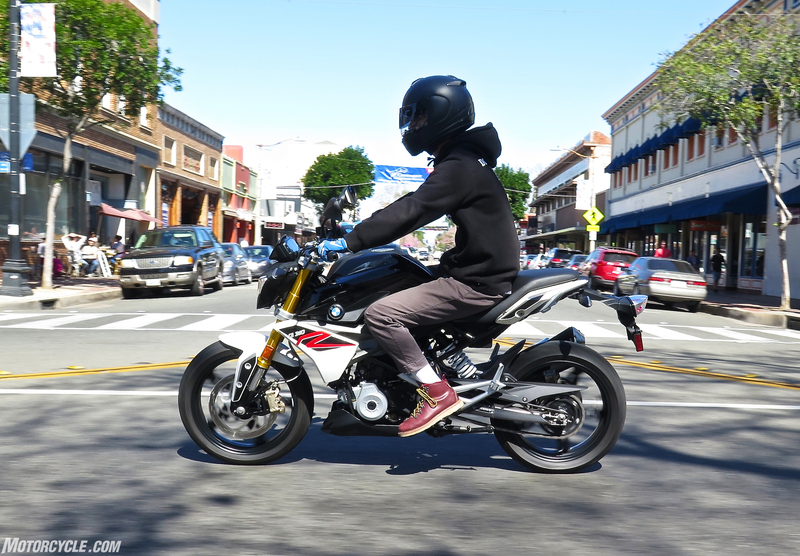 It’s also 8 hp less than the KTM Duke 390 (a perennial favorite), but you can’t win ’em all. 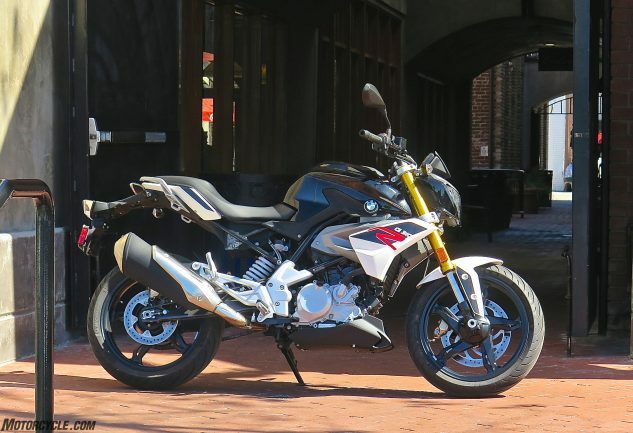 In terms of personality, the BMW lies somewhere in between those two – but in general it feels more like the feisty little KTM than the nicest-people Honda. Weightwise, the MO scales tell us it’s one pound lighter than the CB, at 351 lbs wet, but 25 lbs heavier than the KTM. 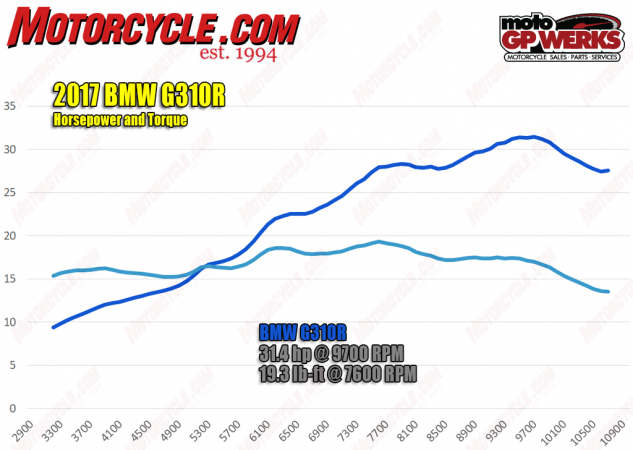 Either way, the BMW feels like a large dirt thumper loose on the street. 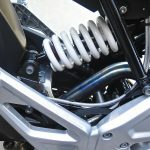 Its main claim to engineering fame is reversing the cylinder so that the intake is toward the front wheel and the exhaust port is at the rear (a la Yamaha’s YZ450F MX bike); doing that and canting the cylinder rearward allows pushing more of the engine’s mass forward for better handling. 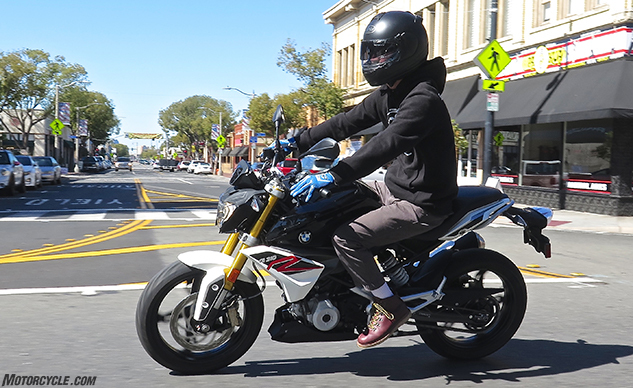 Like the Duke, (and the YZ), something about the BMW wants you to treat it rough. Not a bad-looking little bike, really. And plenty of places to grab onto/strap things out back. Jumping off a bigger bike onto a little one requires a transition period, but once you’re back there it’s stupid teenage fun all over again. The little 313cc Single revs eagerly, fuels smoothly – and its counterbalancer has vibration totally under control at every rpm, including 8,000 and 80 mph. 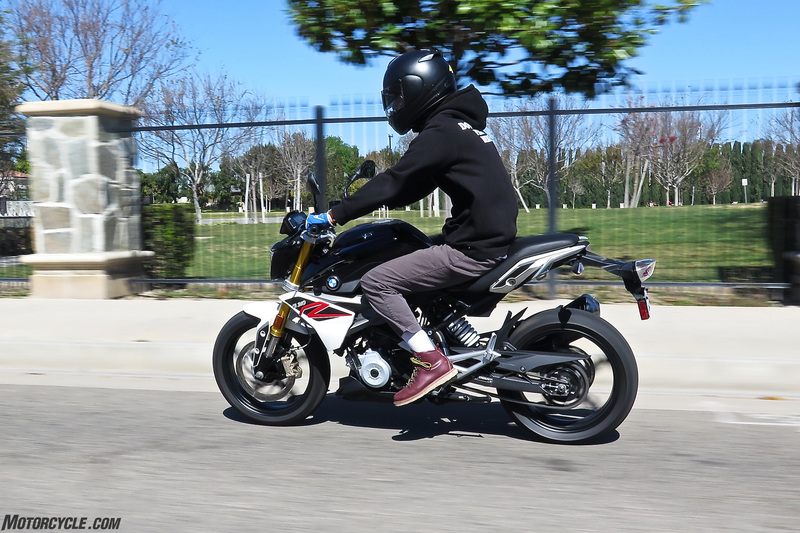 It just hits an indicated 98 mph on level ground when a governor or rev limiter kicks in at just about 10,000 rpm. A quick-turn throttle lets you get to WOT quickly and keep the revs up there, and the really smooth little six-speed gearbox doesn’t much care if you use the clutch or not once you’re past second, both for up- and downshifting. Shifts are quick, smooth and precise. Ergonomics are completely comfortable and transparent, and the seat is quite comfy with a soft lip to hold you in place. High, Standard and Low seats are available. Suspension action from the inverted 41mm fork and single non-linkage shock out back are surprisingly good: 5.5 inches of travel up front and 5.2 inches out back are soft enough to absorb nearly all life’s bumps, but stern and well-damped enough to keep everything on an even keel when you’re channeling your favorite Moto3 rookie in Latigo Canyon. 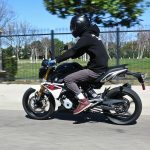 A short wheelbase, 25.1 degrees rake and 102.3mm trail (all numbers are close to the Duke’s) let the lightweight Beemer flip quickly from footpeg to footpeg on its nice Michelin tires. 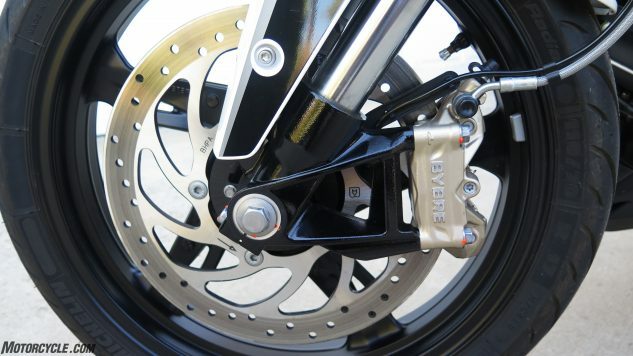 The single 300mm disc up front and its four-piston Bybre (by Brembo, get it?) could be a bit more powerful. I couldn’t engage the ABS with two fingers (though I felt like I was stopping hard enough to, which is a good thing). I needed three or four digits to get the front tire ABS chirping, at which time my eyeballs were pressed into the inside of my face shield. There’s plenty of braking power there; you just need to squeeze. The rear brake, though, seems to engage ABS earlier than it needs to, which means no backin’ er in antics. And there’s no provision to turn the ABS off, either. Add it all up and you’ve got one of those motorcycles with small-man syndrome, constantly needing to prove itself wherever you ride it by jumping up on the sidewalk, chasing cats, blowing off the cars from red lights, revving its motor at college girls in the crosswalk, etc. 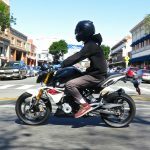 Irresponsible behavior, really, which is pretty much the opposite of what BMW ownership traditionally stands for. Whadaya want for $4,750 anyway? 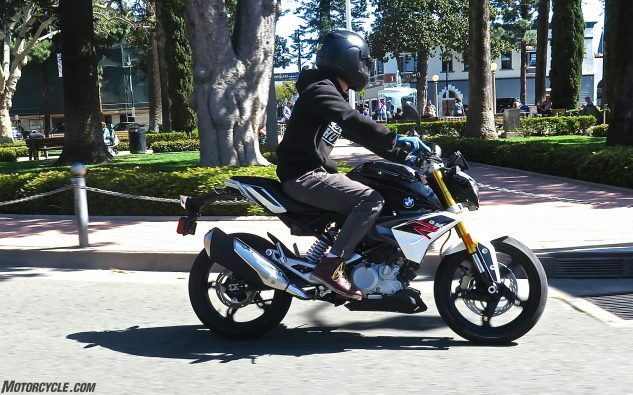 Some smart youngsters will be attracted to the 310 (but it’ll be hard for them to look the past the newly redesigned Duke 390 for a few shekels more). More than a few propellerheads will need one of these as a stable pony/around-town bike to go with their fleet of GSs and K-bikes, and some moto-sophisticates looking to downsize will appreciate this one for exactly what it is – a really comfortable fast-enough modern thumper ideal for carving up the urban maze. For a pittance. 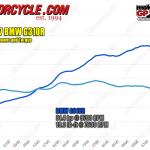 Whether Americans buy it or not is really secondary to BMW. This one’s for the rest of the world. 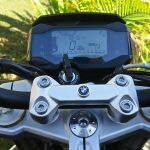 As we learned in Troy’s First Ride review of this bike a little over a year ago, the 310 doubles BMW’s potential customer base, from one million potential buyers to two million. For the money, though it’s definitely bare bones, this is a motorcycle BMW needed have no qualms affixing its roundel upon. 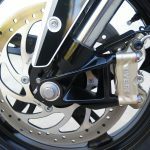 Unlike some bikes we’ve seen from India, there are zero unsightly wire connectors, misrouted cables, horrible welds or hairy moles. 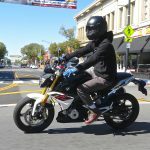 It’s an inexpensive little bike, but not a cheap one. After the initial oil change at 500 miles, she wants clean oil only every 10,000 miles – and valve clearance checks are specced every 12,000. Finger-type cam followers mean you might enjoy doing that yourself. What a concept. But then, that’s what basic little motorcycles like this one are all about, and what makes them so fun to tear around on. The basics, as in getting back to them. We like it.